ep·i·cu·re·an (adj. ): Devoted to the pursuit of sensual pleasure, especially to the enjoyment of good food and comfort. Being an epicurean means, you could fly to the seventh heaven by just encountering a good food! Eye closely shut, murmuring pleasant mumbling from your mouth as you experience that contemplation moment when the flavors stimulated your mind and senses (hence the word "foodgasmic" was invented).No need for drugs, psychotropic substances and the like, food alone can get you high. However in order to go through the never ending quest of good food hunting, an epicurean must also endure the risks that comes with the exploration, including swelling of waistline, increasing weight, and impaired health. High Cholesterol? Bulging belly? While the risks sounds acceptable, in the long run you're facing serious, even permanent trouble. Stroke attack? Diabetes? High blood pressure? Those are the common illness that sooner or later are acquired by excessive and bad eating habit. The truth is, being a true epicurean can be just as dangerous as a drug addicts, and that's why strong epicurean disciplines are needed. As happens with any other habits or activities, when you abuse or overdo it, until reaching the point where you can't say no or stop, it will bring bad consequences. Food addiction is as bad as any other addiction, and it slowly developed through habits. Emotional eating is one of the habits that borne addiction; because when you let your emotion overrules, there will be over attachment for things you know soothes you, and that's where things goes nuts and addiction kicks in. Not to say that you shouldn't enjoy your food, but let's stay sober and conscious all the time that you're eating. This way your mind can still judge when enough is enough. Meaning, knows your body and it's nutrition needs. Take a note of how much energy intake (and nutrition types) fits your lifestyle the best, then abide by these calculations. 1,800 - 2,000 calories a day usually good with moderately active person; meaning regular office joes who spends 6-8 hours a day sitting. Calorie counting challenged? Apply this simple rule: do not overeat, aims for modest satiation. Signs of satiety? Aside from feeling full, usually there will be an early warning in the form of belching/burping. Moderation and being tactful are also two traits that keeps you from overeating. Moderation means knowing what your limits are; physically and emotionally, and consume only what's just enough. It's always better to finish eating with a decent amount of space left in your stomach, than feeling all bloated due to overeating. You can still have a bite later on if you're still feeling hungry, but you can't de-consume what you've already eaten. Being tactful means, measuring your limits against the whole length of eating you have to sit through. If it's a single ala carte dinner then by all means it's alright to finish your plate; however on a multi-courses dinner invitation, don't let your host's hospitality fools you. There's a school of chef who believes "bigger portion is always better" so they send out dishes in large portions, but that doesn't mean you should clean up every plates served. If by habit you're usually feeling full after 15-20 bites of any food, then for a five courses dinner, i.e. : three appetizers, one main, one dessert, then three spoons of each dish is enough, maximum four. And since your body needs regular exercise to work properly, don't forget to hit the road several times a week, jogging and walking are both good, or in the leisure of your own backyard doing a basic cardio to keep your health in balance! Third discipline is to practice the habit of chewing! Aside from making our food soft enough for our body to digest, chewing is also a practice that releases the meal's full flavor and aroma. Scientifically speaking, it happens due to the chemical reaction between your food and you saliva; which physically transform the food into its chemical compounds that your tastebuds identifies as the basic five tastes: sweet, sour, bitter, salty, and umami. The chemical reaction also sends the scents into smelling sensors in your nose, which is on average are 20x more sensitive than your tastebuds. In fact scientists found that your ability to smell plays a bigger role than your ability to taste in "tasting" food. Simply speaking, the more you chews the more its flavors are released, the more pleasure experience you have from eating! The lack of healthy chewing habit, can usually observed in Epicureans who are overweight: they swallows their food before it chewed thoroughly. Since the food is barely processed, it conveys only small amount of experience, which are then compensated with eating more food to achieve that emotional satiation, thus overeating occurs. By letting it to become a habit, various health problems will slowly emerges. 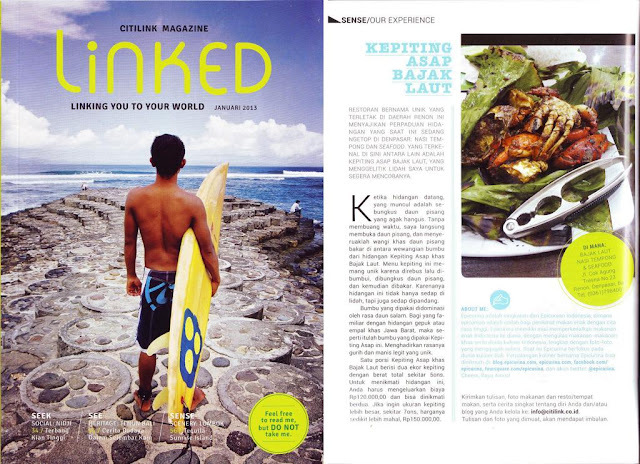 Our review about Kepiting Asap Bajak Laut made its way to the January 2013's issue of Linked; in-flight magazine for Citilink Airways. If you are growing up in Indonesia before the coming of the console games, you have to be creative in looking for amusement. It means bundling up plastic bags to make bola kasti (a lighter version of softball), scouting up good round rocks to participate in sorodot gaplok (foot bowling using rocks), and stacking up pieces of genteng (pantile) for Bancakan, a combination game of hide and seek, softball, and full body contact game. Another kind of creativity practiced by fathers for their kids, is to shape a toy cart made up of the skin of Jeruk Bali fruit, or internationally known as Pomelo.